A small town in Falkirk Council area situated to the north of the River Carron and west of Stenhousemuir. Larbert was strategically important in Roman times, overlooking the point where their road from Stirling to Falkirk crossed the river, with several Roman camps and forts a short distance to the south and the Antonine Wall a mile (1.5 km) beyond. During the 19th Century, the settlement grew from a modest mill-village in association with local foundries, hospitals and the railway. Initial growth was in association with the Carron Ironworks (which opened in 1759), with Larbert later developing its own iron-works to the north of the town. 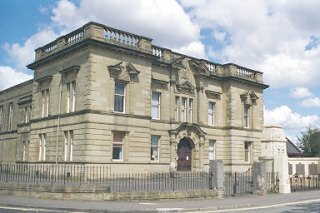 The Scottish National Institution for the Education of Imbecile Children (later the Royal Scottish National Hospital) was established here in 1863, while the Stirling District Lunatic Asylum was founded nearby six years later. Larbert and Stenhousemuir are now contiguous along the B905 road, sharing services and amenities, including schools and a railway station. Larbert Station opened 1848, while Larbert Junction, to the south, is at the centre of the Scottish railway network, connecting lines from Glasgow, Edinburgh and Perth. Local industries today include transport services, metal casting and machining, engineering and the manufacture of plastics and household goods. The iron-works are gone, replaced by private housing developments on both sides of Foundry Loan. The Central Park Business Park was established on part of the former hospital site in 1992, with further private housing on other parts of the site. The Bellsdyke Psychiatric Hospital remains to the east and a new Forth Valley Hospital will open to the west in 2010. The Scottish explorer James Bruce of Kinnaird (1730-94), who discovered the source of the Blue Nile, was born nearby and lies buried in Larbert Old Parish Churchyard. Also born in Larbert were the supporter of parliamentary reform Thomas Hardy (1752 - 1832), iron-founder John Baildon (1772 - 1846), actor Jimmy Finlayson (1887 - 1953) and plant-hunter George Sherriff (1898 - 1967).